The 6 year old boy whose fundus images are shown here had a normal eye examination with 20/20 vision bilaterally 1 year before. He was brought in 3/22/2012 because his vision was poor in the left eye on a school screening examination. The visual acuity of the left eye was 20/200. 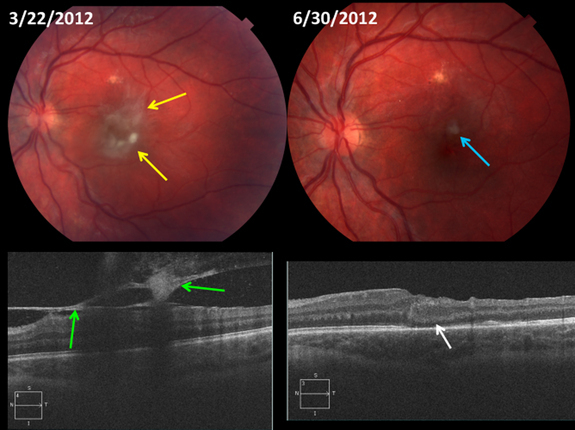 A premacular fibrotic membrane was present (yellow arrows) with overlying vitreous cellular infiltrate. The OCT scan below shows a thick preretinal membrane (green arrows). A vitrectomy, membrane peeling was recommended and done. Both blood and vitreous fluid had elevated levels of toxocara canis IgG antibodies. Postoperatively, on 6/30/2012, the macular anatomy was improved but the vision was unchanged. The blue arrow indicates an amputated stalk of the preretinal membrane. It was felt that excessive tugging on this stalk could have caused a retinal break, therefore it was cut. The boy will see a pediatric ophthalmologist for patching to discover any component of amblyopia in the left eye. He was also referred to his pediatrician for decision making on anti-helminthic therapy (e.g., albendazole). There is no consensus on whether anti-helminthic therapy is indicated in ocular toxocariasis. Approximately one quarter of ophthalmologists surveyed who have treated such patients report using anti-helminthic drugs as part of therapy.